We had a couple of opportunities to lunch at Casa Antigua in the past few weeks. A Central American restaurant that opened about six months ago a few doors down from the Blue Ox, Casa Antigua serves up three meals a day with an extensive traditional menu. On our first visit, we started with the cheese and pork pupusa ($1.75), which was excellent: crispy, cheesy, and wonderful. We moved on to a steak burrito ($7) and the tipico montanero plate ($11.50). The burrito was rich and savory, and the plentiful steak had great flavor. We liked that the whole thing was grilled a bit after having been rolled up, which melted the cheese and added to the texture. 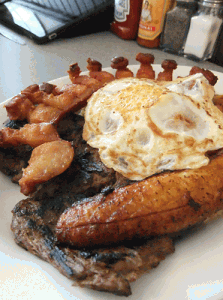 The tipico montenero (Columbian typical dish) consisted of grilled steak, chicharron, rice, beans, fried plantain, and a fried egg. It’s served with corn tortillas and a side salad. Quite a big portion, there was no way it was all going to be eaten in one sitting. 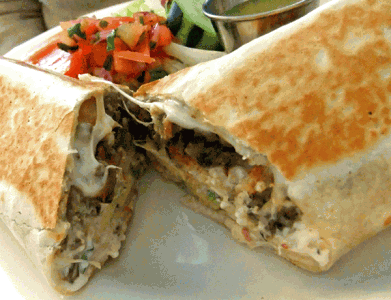 After having tasted the carne asada in the burrito, the steak was our least favorite part of the meal. While it had good flavor, it seemed dry and a little chewy. The chicharron, which the menu translates as pork rinds, is fabulous if thick chewy bacon is up your alley. The corn tortillas are fresh and hand-made, but thick and lack the flavor we are used to. On our second visit, we were joined by Corey Jackson from Downtown Lynn, Emily O’Brien from the Urban Wine Project and Exposed Urban, and Brian Knowles of The Gringo Chapin. We discussed our choices while munching on the addictive freshly made tortilla chips. 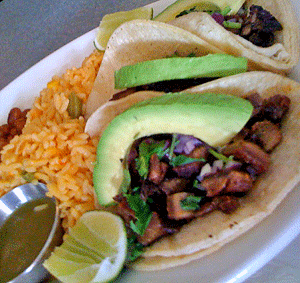 Brian was intrigued by the tacos de lengua, as he had recently eaten beef tongue elsewhere. He ordered the tacos combination ($8.50), served with rice, beans, and fresh avocado and enjoyed it so much he was inspired to buy lengua later that week to prepare at home. Never having tried tongue, we tasted it and found the meat surprisingly tender and tasty. Other plates at the table included churrasco, a traditional dish of steak, rice, and beans ($11) and the plato alla Antigua ($14) which featured grilled chicken and shrimp with accompanying vegetables. The shrimp were tender and highly flavored ($11). 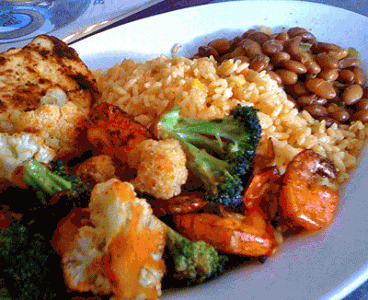 In fact, while we really enjoy the salty seasonings used in quite a bit of Casa Antigua’s food, those looking to reduce their sodium intake should consider themselves forewarned. 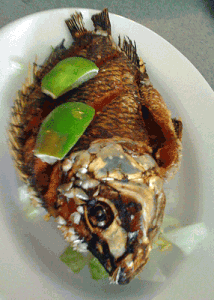 The star of the afternoon was Emily’s pescado frito. We had all expected the fried tilapia ($10.50) to be standard fillets, so were delighted when a whole fish was placed on the table. Despite its wonderfully crusty exterior, the interior was tender and flakey. If you’re looking to move beyond the same old lunch places, add Casa Antigua to your short list. It looks a bit dark from the outside, and the music is quirky (both times we visited, the TV, piped music, and juke box all randomly fought for airspace), but the food is hearty and appealing, the prices are reasonable, and the staff is efficient and cheerful.